We’ve teamed up with Glow Bar on Mortimer Street to create some exclusive breakfast bowls to keep you functioning and feeling good all day, every day. Created using carefully selected natural ingredients, Glow Bar’s menu has been designed to help you stay energised, grounded and nourished. 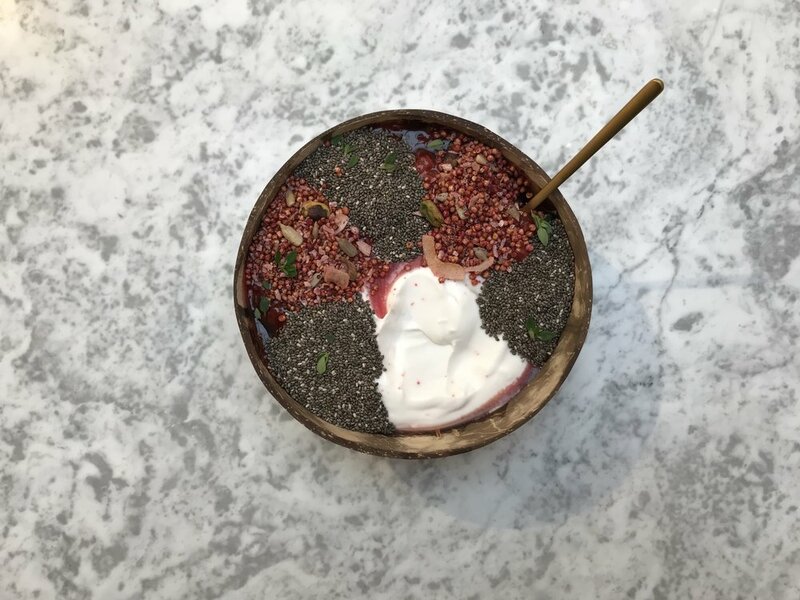 The Pitaya Bowl (below left) is made using blended pitaya, banana, mango and topped with our two of our best-selling quinoa granolas (Mixed Berry & Coconut Quinoa Oat Crunch and Almond & Vanilla Qnola) with coconut, chia seeds and almond butter. The Brekkie Bowl (above right) is made from a base of Cinnamon & Vanilla Quinoa Oat Crunch granola and coconut yogurt, topped with Glow Bar’s homemade seasonal spiced plum compote, Beetroot & Pistachio Qnola, coconut nectar and chia seeds. Head down to Glow Bar this week to enjoy their deliciously nourishing menu.